Ashley Nicole Style : Shobop Event of the Season Sale - All My Must Have Items! Shobop Event of the Season Sale - All My Must Have Items! The Shopbop sale is here!!! 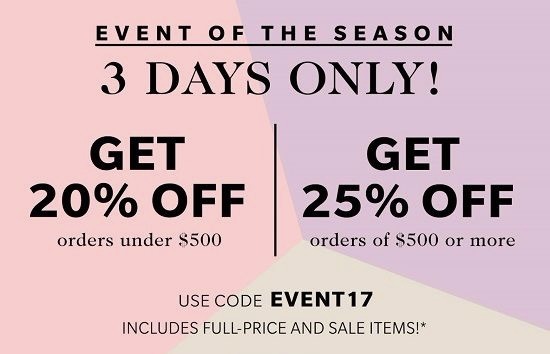 With prices up to 25% off, no minimum purchase required, and tons of sale pieces included, now is the time to shop and save! Cha ching! Below I've rounded up my top sixty - yes, 6-0 - must have's. Simply click the image, and you'll taken right to the product! From off the shoulder tops, to cell phone cases, travel accessories, jeans, handbags, and more, you don't want to miss your chance to purchase the hottest items of the season. As of now, all sizes and colors are available in everything I've linked. But don't wait long, deals like this go fast! Don't forget to use code EVENT17 to get your 20-25% off!